Bathroom wall cabinets work like a clean storage system in a tight space, in which case, making extra room on the floor is more like having a traffic jam on the flyover. Nowadays, people are more concerned about making functional storage cabinet, instead of spending hours searching toothpaste in the bathroom. In that case, wall cabinets for the bathroom are a modern solution for every tireless citizen of a burgh. A bathroom is a place, from which every single human being starts their day after waking from a long night sleep. The toilet is a piece of necessary hardware, and many other needs are also served by it. If you want to reach early in the office, you have to prepare yourself as fast as possible, but preparing yourself early in the morning without having everything in hands reach is quite difficult. Wall cabinets for bathroom are a convenient place for storage. Installing a wall cabinet can be a straightforward job if you have the detail information and ideas about the layout, measurements and necessary tools. Usually, two people can do this set up without grinding, and no significant construction is needed. Few tools are involved in this task. These are also easy to find. The critical part of this whole procedure is how to do it, and here we are to help. We will guide you through a simple though sophisticated decree, to set up bathroom wall cabinets. After installing the cabinet by tracking our instructions, we can guarantee, no one can find that professionals do not do it. You need the following tools to get the job done. A proper cabinet installation starts with appropriate positioning. You have to remove the shelves and doors from the cabinet and make it empty. It makes the installation easy and damage free. After that, choose where you want to mount your bathroom wall cabinets. It is better if you choose a center point in your bathroom. Then mark outline in the wall with a spirit level for the cabinet. While doing all these little tasks always remember about your safety, because nothing is more important than your precious health. Put on the gloves and ear puffs and wear the safety glass before starting the installation. Take a measurement and mark on the wall with a pencil. After that, put the stud finder on the wall and find out two walls stud and mark the location. Commonly studs are 16 inches apart. Locating the stud point is very crucial for securing the cabinet to the wall. Put a nail into each marking points, after locating the studs. Before securing the cabinet to the wall, these nails will prevent it from falling. With the support of the nails, recline the bottoms of the cabinet. While resting the cabinet on the nails, measure the distance between the bottoms of the cabinet to the stud nail. Use the tape measure to mark the distance. This will be the distance where the screw will be placed to attach the cabinet. You should use the right screws because the whole cabinet mounting to the wall depends on it. You can search for better screws and tools in various trusted websites. Now, you have to connect the cabinets to each other. The cabinet parts can be two or more than that depending on your demand. While clamping cabinets together, make sure that those are lined up correctly. It’s time for securing the cabinets to the wall, but you can lose one or the other to make a proper line up for the frames. A clamp done with hand-screws doesn’t flex, and it makes a firm grip. Make a predrilled hole before screwing them together. You can do the drilling and place screw heads to the less obvious cabinet, by doing that, you can avoid pointy looking edge on your beautiful cabinet and maintain its style. Use someone’s help to hold the cabinet and put the screws in the right places. 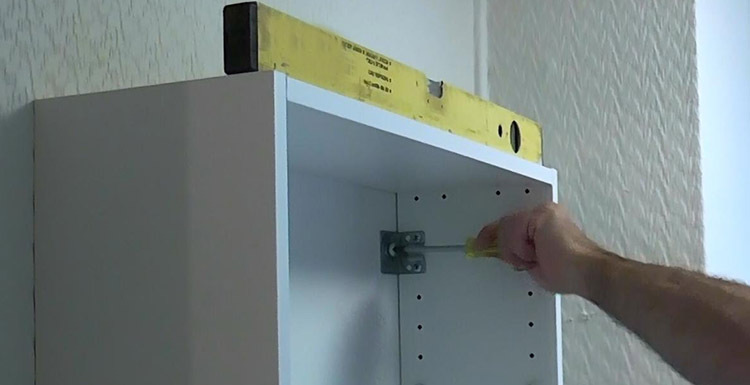 One thing you should remember before driving the screws into the holes, make sure that the cabinet is resting in the exact location because after installing the screws there will be no coming back from errors. After finishing the screwing, set back the doors and selves that you removed previously for making the cabinet light in weight. See! Not that difficult. Now it’s your turn to make the difference. Track the steps one by one, and you will set up your bathroom wall cabinets with ease. Wooden bathroom wall cabinets can be an excellent choice for your bathroom storage, though you can set up stainless steel or stone cabinets as per your requirements. Just remember few things and does every little bit of the operation with caution. Always maintain safety gears, while drilling or driving the screws. Though Bathroom wall storage cabinets are not that heavy; moreover, lift them with the help of someone to prevent injuries.